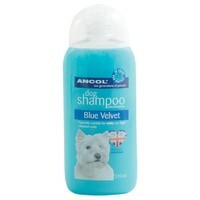 Ancol Blue Velvet Dog Shampoo 200ml is a luxury shampoo and conditioner that has been specially formulated for those dogs with white or lighter coloured coats. Made with natural ingredients and enriched with minerals and vitamins to provide full nourishment, this fantastic shampoo gently cleans and conditions your dog's coat leaving it beautifully soft and clean. Treat your dog to a luxury scrub to revive their shiny velvet coat and have them feeling fresh and clean! Concentrated solution for even more washes.